Find the perfect Paper Bags for your store's collections! 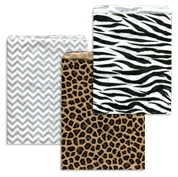 Shop quality items, with golden or silver designs or even zebra & leopard patterns. Available in different sizes, from small & medium to large, for all your jewelry pieces. Get the best deals thanks to our wholesale discounts!